Tom Wilson, President, InSync Healthcare Solutions The The concept of electronically recording patient information through Electronic Medical Records (EMR)–has been prevalent since the late 60’s when Dr. Larry Weed introduced Problem Oriented Medical Records into medical practice. Until then, doctors recorded only their diagnoses and treatment details. Dr. Weed’s innovation was to produce a record that would permit a third party to independently authenticate the diagnosis. Although the notion was widely hailed as an advancement in medical practice, physicians did not quickly jump to adopt the technology. Fast forward to 2016 and things have drastically changed. Today, the survival of a healthcare enterprise majorly depends on the efficiency of the EMR in place. 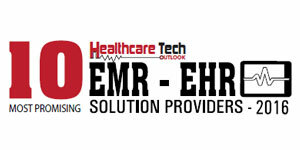 This is propelling the growth of the EMR market in the U.S., according to Research and Markets, at a CAGR of 6.53 percent over the period of 2014-2019. Meanwhile, the market is in a state of flux owing to regulatory pressures and changing industry trends. For instance, under the Medicaid incentive program, providers and hospitals are considered compliant only if they acquire and install an EMR and successfully demonstrate Meaningful Use for every succeeding year. Now that the initial wave of Meaningful Use incentives for automation are complete, providers and healthcare IT vendors are shifting their attention toward identifying technology that supports their business and patient care objectives. Florida based InSync Healthcare Solutions is leading this transition with fully integrated, easy-to-use, cloud-based healthcare IT solutions, enabling medical practices maintain compliance while increasing productivity and profitability. With a powerful, Meaningful Use (MU)-2 certified, integrated EMR and practice management (PM) software, along with revenue cycle management services, InSync serves thousands of healthcare professionals across the United States. Founded as a full-service health information management (HIM) solution provider specializing with specialization in ambulatory EMR and PM, the company today has etched out a distinct stature in the healthcare community. “Our transformation as a complete solution provider is fulfilled by the strong in-house product development team, that constantly adds new features based on market analysis and inputs from InSync’s customer advisory council,” begins Tom Wilson, President of InSync. This is complemented with the company’s long-standing associations, partnerships, and proven business models that translate to better efficiency for healthcare organizations. According to Wilson, to deliver a comprehensive result, an EMR should not only capture all of the required data and information, but in a manner that enables the organization to adapt and merge it with existing workflow of the practice. “However, the market today is flooded with a significantly different approach—delivering a fixed set of workflows and content in EMR,” says Wilson. “In other words, the practice has to conform to what the EMR vendor sees as the ‘standard’.” InSync has taken a “concierge approach” towards this, starting right from the customer engagement and sales process.Rather than making assumptions based on the practice specialty, the company takes time to listen to customers and understand their objectives in considering a new EMR. Once InSync’s team of professionals collect the required information and create a profile, they construct a product demonstration relevant to the specific needs and objectives of the practice. InSync then progresses onto implementation and training, followed by go live and long-term support—all the while maintaining their concierge style of engagement and service. “InSync EMR/PM starts with a robust and flexible data architecture, and then layers on the user interface and specialty-specific content in a manner that adapts to each of the various specialties within a practice,” explains Wilson. “We can turn features on and off, adjust prompts to better match the practice’s vocabulary, include forms and other content that the practice is already using, and tailor the user experience to fit their unique needs.” In an instance, one of the company’s customers embraced InSync’s solution to change from paper based records to EMR. The customer already had a sophisticated workflow process inside their multi-facility practice. Leveraging InSync’s integration capabilities, the customer was able to retain their homegrown practice management and laboratory software, and interface the data directly to the InSync platform. For many providers, implementing EMR is a huge challenge, as it often means focusing on the computer more than the patient. In this specific instance, the provider had developed an exceptionally effective process that allowed him to see up to 70 patients each day. During implementation, the InSync team was able to emulate the existing work flow, allowing the doctor to see the same number of patients in approximately the same amount of time, but with much better capture of structured data required to support Meaningful Use core measures. The configurability of InSync’s platform also helps healthcare enterprises to rapidly bring down their operational costs while better serving the patients. For instance, InSync’s Revenue Cycle Management can be integrated with EMR/PM to create efficient and effective solutions meeting the administrative needs of an organization. The service assists clients in streamlining their billing process and simplifying workflows, allowing healthcare organizations of all sizes to minimize operating costs, improve productivity, and achieve long-term bottom-line improvements. “We work closely with our RCM client practices to try and maximize their immediate cash flow, ensure claims are submitted cleanly and paid promptly, and outstanding Accounts Receivable (A/R) is dealt with appropriately,” explains Wilson. The company monitors the latest technology trends and regulatory measures in order to stay a step ahead of their competitors. A recent addition is mobility—for both the provider and the patient—by offering InSyncMobile that supports on-the-go care while maintaining the necessary patient history. InSyncMobile is not an adjunct or separate application, but is an extension of the company’s core product onto any device, including smartphones and tablets. “Being able to treat a patient from a distance is certainly the next wave of innovation in the healthcare space,” explains Wilson. “To facilitate this, we’re delivering the key features through a user interface which is intuitive and scalable to both device capabilities and to the needs of the provider.” InSyncMobile offers unique functionalities while maintaining the confidentiality, security, and integrity of the data. While multiple product enhancements are on the road map, InSync is currently focusing in particular on the behavioral and mental healthcare sector. Most EMRs are focused on the individual provider-patient encounter, “But our software allows scheduling group therapy sessions, group treatment plans and notes, and the ability to easily transfer those notes into individual patient records,” says Wilson. Another recent enhancement is a Practice Dashboard where the office manager can quickly see and assess the financial trends and health of the practice. The dashboard provides a financial perspective of outstanding revenue, claims, and pending payments, as well as the ability to dive deep into any of the metrics. InSync makes it a point to leverage their partnership with industry leaders to offer add-on technologies and new tools to customers. “This requires a deep investment in both technology and maintenance,” says Wilson. “With partners like Alpha-II, we can bring solutions to market more quickly and stay abreast of industry and regulatory requirements,” he adds. This helps InSync focus their resources on the core technology, and also be responsive to their customer’s requests. Since January 2016, the company has delivered more than 200 customer-requested enhancements, assisting them with workflow, reporting and ease-of-use solutions. Going forward, InSync clearly sees changes in the healthcare landscape and EMR market from a regulatory perspective. “While the end of Meaningful Use has been over-hyped, the reality is Meaningful Use will eventually be redefined to bring the program back closer to its original intentions—improving patients’ quality of care and increasing data interchange capabilities,” says Wilson. “It will change the EMR market from being provider and automation centric towards being data analytic and especially patient centric. We’re already working towards evolving our solution along both of these paths,” says Wilson. For a company like InSync Healthcare, achieving this objective will be a mantra and a responsibility for years to come.